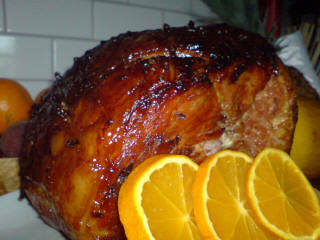 Most people have ham at one time or other during the holidays. For New Year’s Day I usually scour the supermarket to find a small ham that has been made without additional water. The difference in taste, appearance, and texture from the water-added varieties is significant, but there are not too many choices to be had. After a successful trip to Price Chopper, we were able to enjoy a glazed baked ham, studded with oranges and cloves, with the traditional Southern side of black-eyed peas on January 1st. The problem comes in when there are only two people eating a three-pound piece of meat. What do you do with the leftovers? This year I came up with two ideas inspired by dishes we’ve had in Europe. Once in Alsace at noontime we happened upon a restaurant where a small wedding dinner was taking place. We hesitantly asked the waitress if there was any possibility of the two of us having lunch there. After checking with the chef, she said it would be all right, but it would have to be something simple. Ah, if I could only come up with such a delicious meal in so short a time: mushroom vol-au-vent with a green salad. Unforgettable! 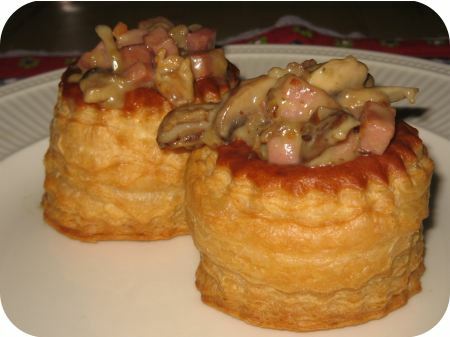 Anyway, remembering that experience, I decided to fill Pepperidge Farm puff pastry shells with ham à la king, adapting a recipe I found on the Internet. First, I made a white sauce combining about 2 tablespoons of butter with an equal amount of flour. After cooking that for a minute or so, I poured in a mixture of chicken broth and milk till it was the right consistency—moderately thick and quite creamy. Then I put in 1 teaspoon of Worcestershire sauce and 1 teaspoon of Dijon mustard, plus a cup of diced ham, ½ cup of frozen peas, some grated gruyère cheese, and ½ cup of pimento-stuffed sliced olives. I added a tablespoon of chopped parsley before filling the baked pastry shells. Et voilà! That’s all there is to it: less than 30 minutes from start to finish. A second idea came to me from the time I spent in Switzerland during my junior year in college. Like many simple recipes such as French crêpes, rösti was originally created by the poor to feed themselves and their families on a budget. I believe I had the Swiss German dish for the first time at the Belvedere on the main street of Fribourg. Why I thought of it now is anybody’s guess! Basically made of grated potatoes (a lot like hashbrowns), rösti can be modified in a number of ways. 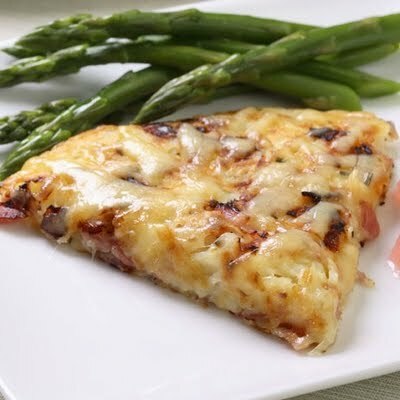 For my version, I started with one beaten egg, to which I added one minced shallot, a cup of diced ham, ½ cup grated gruyère cheese, some chopped chives, salt and pepper. I then grated into the mixture 3-4 small to medium raw potatoes. (Another variation could include chopped rosemary and some scallions.) Then I scooped up about ½ cup and put it into a skillet containing canola oil and melted butter, set on medium high heat. I cooked it for about 5 minutes on one side, till it was becoming brown on the edges. I then flipped it over for a few minutes before finishing it in a hot oven for about 10 minutes. I accompanied both dishes by a simple green salad vinaigrette. Delish! 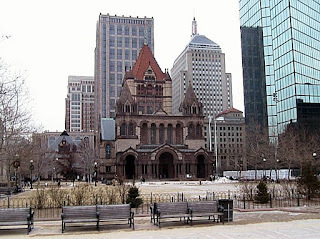 Anyone who has ever been to downtown Boston has seen the large expanse of the Public Garden and the adjacent Common. 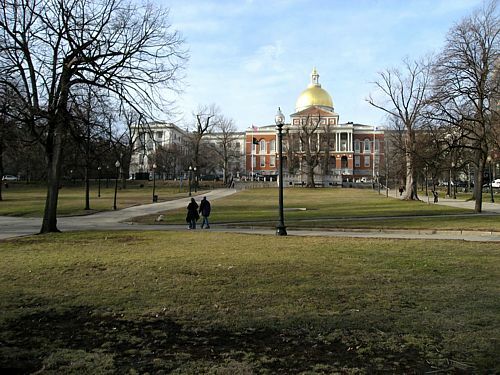 Just up Beacon Hill behind the Common it’s hard to miss the red brick façade of the Massachusetts State House, which has been in this location since 1798. The beautiful structure, designed by Charles Bullfinch, was built on land that once served as a cow pasture for the famous John Hancock. Its dome, originally made of wood shingles and subsequently sheathed in copper by Paul Revere, has been covered in 23 karat gold leaf since 1874. Apparently the dome was painted black during the Second World War to protect the building in case of potential bombing attacks. In late December I decided to take advantage of one of the capitol's free guided tours. I learned several interesting things visiting the state house. According to our guide Jane, the Army Nurses’ Memorial, installed in 1914, was the first monument anywhere in the world to recognize the role of women in history. 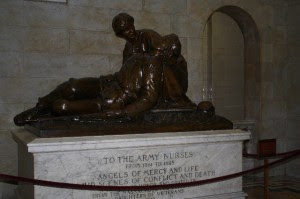 The bronze statue, designed by Connecticut native Bela Pratt, honors the nurses who cared for soldiers during the American Civil War. In nearby Memorial Hall, there’s a painting dedicated to the well-known involvement of Paul Revere in the American Revolution. 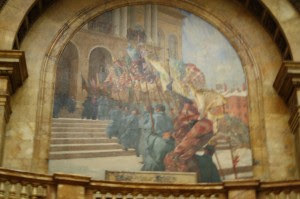 Another Civil War reference is a mural celebrating the contributions of the all-African-American 54th Regiment in the Union Army. At the top of the Grand Staircase, Jane also recounted an amusing story about the creation of the first Massachusetts state seal. It seems that someone in England, who had never been to the New World, was asked to place a Native American coming in peace with an arrow pointing down within the design. He created a very atypical looking figure dressed in a fig leaf with the motto "Come over and help us"! Needless to say, the seal has undergone several transformations since that time. 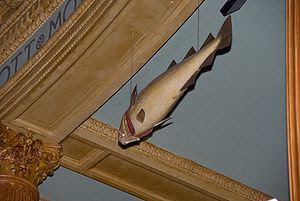 Upstairs we visited the House of Representatives chamber and heard about the “sacred cod.” A gift of a certain John Roe, it was meant to underscore the importance of the fishing industry in the early years of the commonwealth. At one point in the 1930s several, spirited Harvard University students “cod-napped” the fish, but it was safely returned to the chamber. When it was decided that the Senate would move into that room and that the Representatives would go to a different location in the state house, the Senators were overjoyed at the prospect of inheriting the "sacred cod." 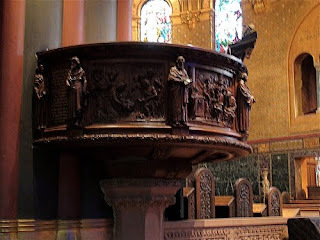 But after the Representatives insisted on taking the cod with them, the disappointed Senators got their own fish symbol, now referred to as the “holy mackerel.” Oh, those jovial Massachusetts legislators! 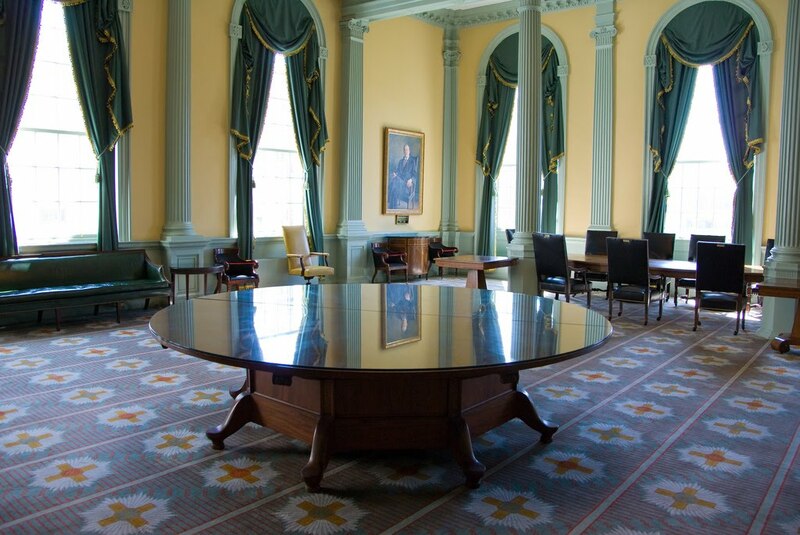 One of the highlights of the tour was the beautifully renovated Senate Reception Room. 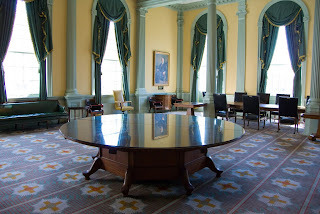 Formerly the site of the Senate chamber, it is now used on ceremonial occasions. Last spring a friend gave me a so-called Bon Vivant Journal which has a quotation on the back cover by the famous turn-of-the-century French author Marcel Proust: “The voyage of discovery lies not in finding new landscapes, but in having new eyes.” Many of us have had the occasion to travel to exotic destinations armed with cameras, ready to observe unusual places of interest. But the idea of seeing what’s around us with new eyes is a very insightful claim. While I’m not a native of Boston, I spent three years living there as a young woman and never really saw the extraordinary beauty that was right in front of me. 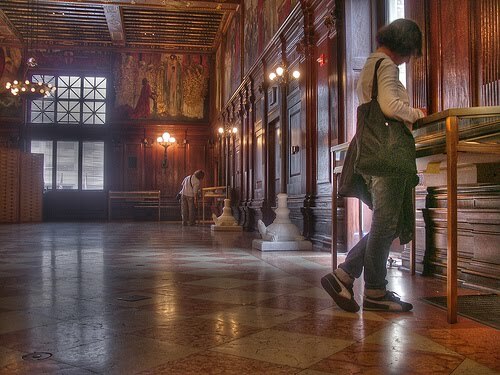 Take the Boston Public Library, for example, which I never realized is considered one of the most beautiful public libraries in the U.S. Fortunately for me, the complimentary Where Magazine in our hotel listed days and times of the free one-hour tours. Dan, the guide, told us that the BPL, the oldest municipal library in the United States, is also a presidential library, having nearly 4000 books from John Adams. 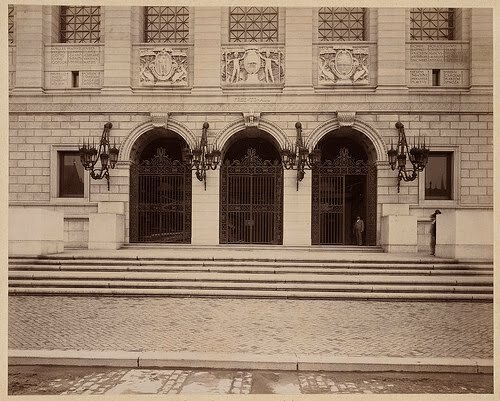 The present building, erected by the architecture firm McKim, Mead, and White in 1848, is in the Italian palazzo style. It has twenty-eight varieties of marble and grillwork similar to that of Paris’s Musée d’Orsay and the Basilica di San Marco in Venice. For decades many of the features of the library were covered in carpet or veiled in soot from the former Back Bay Railroad, once situated where the Prudential Building now stands. As a result of a 150 million dollar renovation begun in 1991, the building now reflects its former glory. On the cold evening we were there, the ground was covered by 14 inches of snow, forcing us to begin the tour indoors. 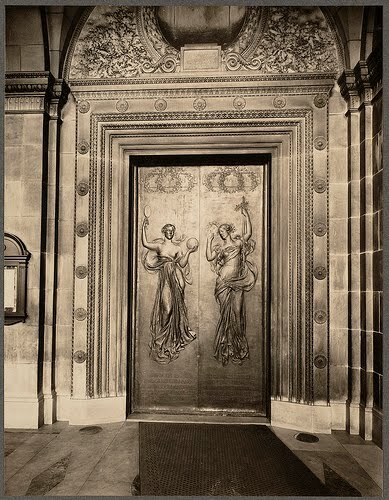 In the foyer our guide pointed out three sets of beautiful bronze doors by Daniel Chester French, representing the muses of Wisdom, Truth, Poetry, Romance, Knowledge, and Music. 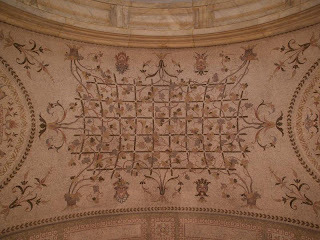 Through the doors, one finds a vaulted ceiling covered by decorative mosaics, some celebrating prominent Bostonians such as Adams, Emerson, and Peirce. 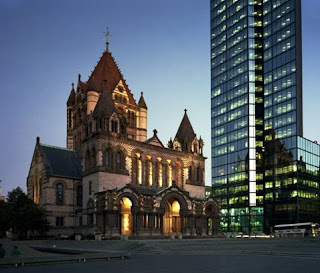 I should add that mid-nineteenth century Boston had the good fortune to be the new residence of many Italian artisans who were able to use their artistry to complete this part of the project. 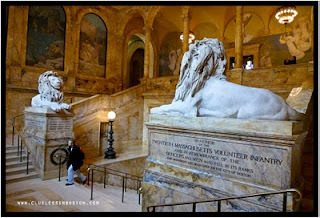 The grand staircase of Siena marble was designed by Parisian Pierre Puvis de Chavannes, who (believe it or not) never went to Boston! He simply created a model in 1/10th scale which the crew in the U. S. used to assemble his creation. 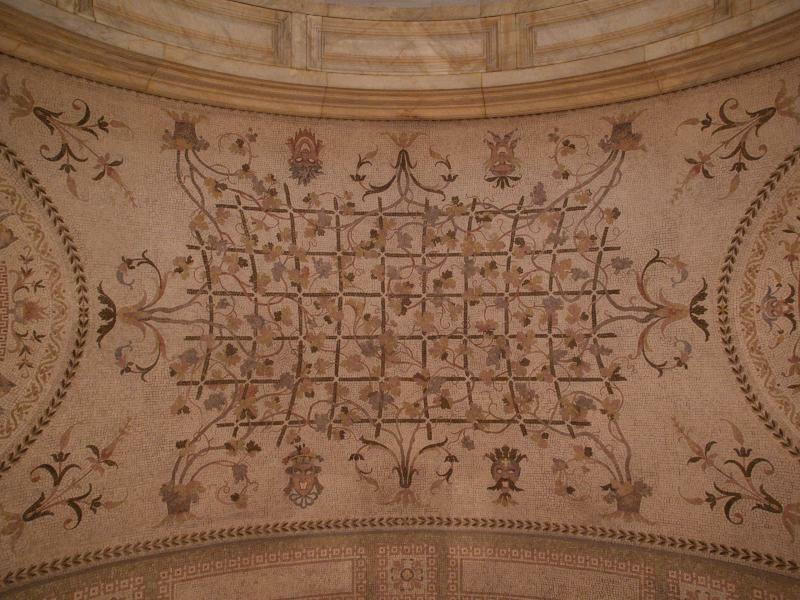 The resulting flight of stairs, flanked by two unpolished marble lions and the artist’s murals which were rolled up and sent from France, is truly gorgeous. At the top of the steps you enter the Bates Reading Room, which rivals that of the New York Public Library. 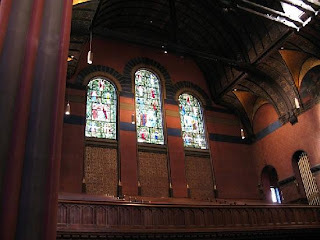 The space is lovely with its green-shaded lamps and shotgun windows which look out onto Copley Square and Trinity Church. 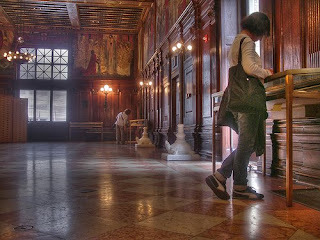 Just outside of the reading room is the Delivery Room which continues to use its 1887 system for distributing some of the library's 8 million books to patrons. 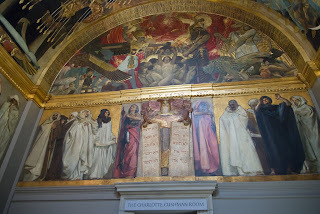 This area, also known as the Edwin Austin Abbey Room, is lined with the artist’s murals illustrating Galahad’s search for the Holy Grail by Tennyson. 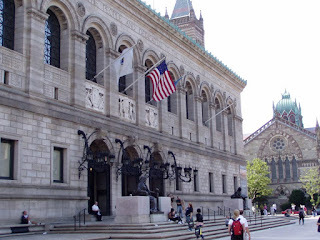 As if all this weren’t enough to classify Boston’s main library as a masterwork, the third floor is not to be missed. Besides a collection of books and memorabilia dedicated to Joan of Arc, there are murals by John Singer Sargent. 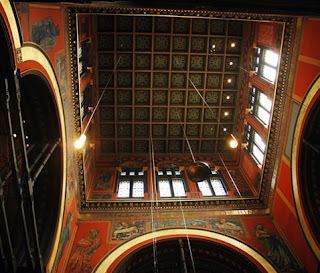 A friend of the architect McKim, Sargent decorated opposing walls portraying figures from the Old and New Testament. 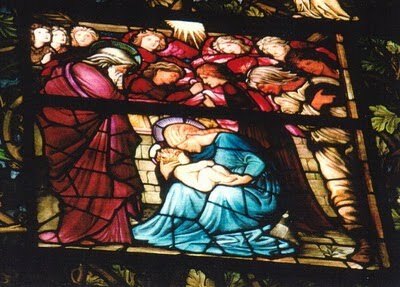 There are even three dimensional elements which protrude from the surface adding to the beauty of the paintings. Finally, if you have the opportunity to visit this library in warm weather, be sure to see the courtyard where you could have lunch and admire Bacchante and Infant Faun by Frederick William MacMonnies. The naked statue was “banned in Boston” for awhile by prudish nineteenth century residents but is now back where she belongs--in the middle of the reflecting pool. Amusingly, a bust of the principal opponent of Bacchante is placed facing her for all eternity.